“He (Mohammed) seduced the people by promises of carnal pleasure to which the concupiscence of the flesh urges us. His teaching also contained precepts that were in conformity with his promises, and he gave free rein to carnal pleasure. In all this, as is not unexpected; he was obeyed by carnal men. 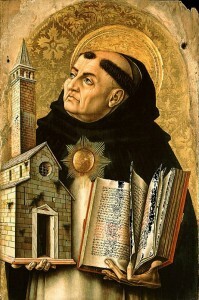 He did not bring forth any signs produced in a supernatural way, which alone fittingly gives witness to divine inspiration; for a visible action that can be only divine reveals an invisibly inspired teacher of truth. On the Contrary, Mohammed said that he was sent in the power of his arms – which are signs not lacking even to robbers and tyrants. 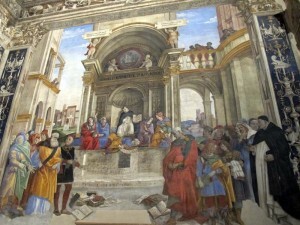 What is more, no wise men, men trained in things divine and human, believed in him from the beginning (1). 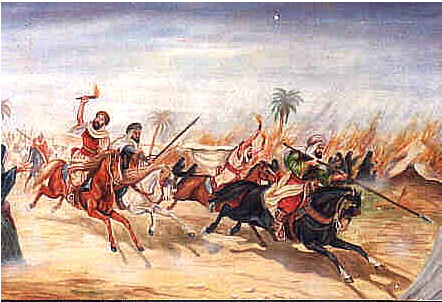 Those who believed in him were brutal men and desert wanderers, utterly ignorant of all divine teaching, through whose numbers Mohammed forced others to become his follower’s by the violence of his arms. Nor do divine pronouncements on part of preceding prophets offer him any witness. On the contrary, he perverts almost all the testimony of the Old and the New Testaments by making them into a fabrication of his own, as can be seen by anyone who examines his law. It was, therefore, a shrewd decision on his part to forbid his followers to read the Old and New Testaments, lest these books convict him of falsity. Tlaxcala for Mass and renewing baptismal vows in Cortez’s don’t from 1520. Fr. Jame’s homily and whole baptismal renewal here. Lunch in a La Gruta, an underground cave. Great food including ant eggs and larvae. 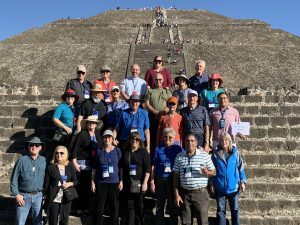 Climbing the Teotihuacán Pyramids and arrival in Mexico City. Today we visited the Aztec Temple in Mexico City. The cathedral of Mexico City was built right next to the 500-year temple. 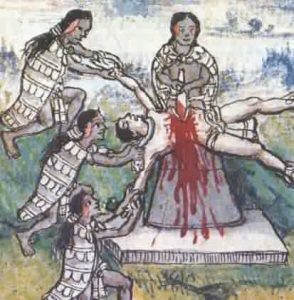 I did a lot of study on the Aztecs and their massive human sacrifices and cannibalism. I realized there was a great tie-in with the Catholic faith, the sacrifice of Christ and abortion which is also human sacrifice. I share the history and my discoveries in this short video on location.